When you live for millennia, you have a lot of time to nurse a grudge. And both Nahiri and Sorin Markov have spent a truly impressive amount of time ruminating on how much they hate each other. These two have a lot of history between them. Both of their sparks ignited in the pre-Mending age, when Planeswalkers commanded godlike power—power that Sorin first taught Nahiri to use. He became a mentor to her, an almost parental figure, and showed her many different planes as she learned to travel the Multiverse. When they became aware of the Eldrazi titans (and the world-devouring threat they represented), Sorin and Nahiri teamed up with Ugin to deal with them. Nahiri's home plane, Zendikar, was uniquely well suited for their plan, so she reluctantly agreed to lure the monsters there. Their audacious plan worked. Ulamog, Kozilek, and Emrakul appeared in physical form, and Nahiri used her lithomancy to create the network of stone hedrons that suppressed and imprisoned the titans. The three Planeswalkers parted ways, Nahiri, alone, remaining on Zendikar to watch over the Eldrazi and protect the plane from any other threats. Centuries passed in relative peace . . . but then the hedron network was disturbed, and the titans began to stir. Nahiri signaled her old allies to come to her aid. Neither responded. Neither appeared. She managed—barely—to restore the prison on her own, then immediately set out to find and rescue Sorin. After all, unless he himself were imprisoned or dead, what could have stopped him from answering her call? When she found him on his own home plane of Innistrad, very much alive and wholly focused on the problems of that world, her relief quickly turned to anger. When he dismissed her distress and offered no apology for his silent absence, the bond between them shattered irreparably. They fought. 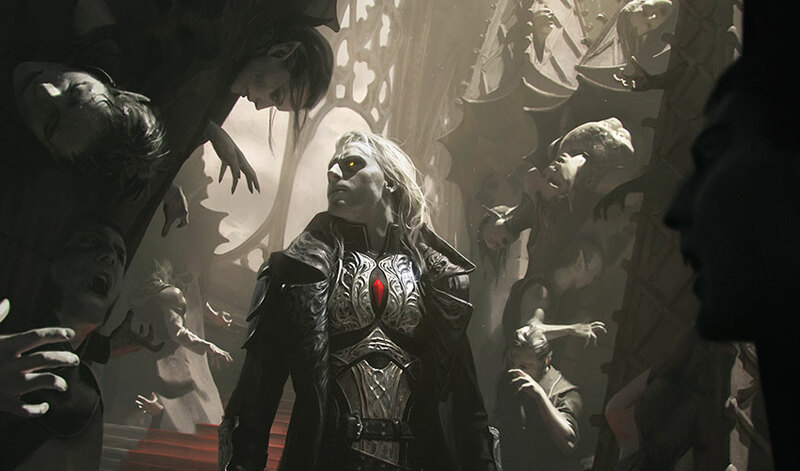 With the newly created Avacyn's help, Sorin managed to seal Nahiri inside the Helvault, trapping her in a lightless void that neither lithomancy nor planeswalking could break through. It was bad enough when she was alone . . . but then the Helvault began to fill with demons. Lots and lots of demons. For a thousand years, she lingered, clinging to sanity with an iron will, until the Helvault was shattered. She returned to Zendikar to find her worst fears realized: the Eldrazi titans had broken free, and huge swaths of the plane lay in ruin. Battered, exhausted, and surrounded by the desiccated remains of her beloved home, she vowed to pay Sorin back every bit of the suffering he had caused her—and more. Her first stop was Markov Manner, Sorin's ancestral home. Sorin himself was absent, but she left her mark; he would eventually return to find the manor itself reduced to rubble and the vampires he'd left there entombed creatively in bits of masonry. And that was just to send a message. Nahiri's true plan was far, far more ambitious. Using the same principles of lithomancy that she used to create the hedrons on Zendikar, she began creating cryptoliths—stone formations that allowed her to manipulate the magical ley lines across all of Innistrad and corrupt the plane's mana. This corruption first warped Avacyn's mind, turning her from the chief protector of Innistrad's humans into their twisted exterminator. Sorin, heartbroken, was forced to personally destroy Avacyn—just as Nahiri had hoped. Soon her true revenge arrived from the Blind Eternities in the form of a mass of tentacles and contagious madness: Emrakul, the last of the three original Eldrazi titans. Nahiri had sworn to make Sorin suffer as she had suffered; allowing the Eldrazi to devour his home plane—the one he abandoned her to protect—seemed like the perfect payback. As Emrakul's terrible influence spread across Innistrad (despite the Gatewatch's best efforts), Sorin and Nahiri met again in battle. This time it was no quarrel between old friends. It was war. Their duel was savage and epic. While their armies clashed around them, they fought through, around, and over the ruins of Markov Manor. Both wielded their fearsome powers without mercy, fueled by lifetimes of rage. They traded the upper hand many times, both sustaining grievous wounds, blind to everything but each other. Finally, Sorin managed to disarm a fatigued and injured Nahiri. He sank his fangs into her throat and began to drain the lifeblood of his former protégé—but she had one final trick up her sleeve. With the last of her fading strength, she commanded jaws of stone to snap shut around him, piercing his body with giant rocky teeth. His magic kept him alive, but the agony made planeswalking impossible. He was trapped. Beaten. Nahiri didn't kill him. Instead she positioned his stone tomb to give him an excellent view of Emrakul. Forcing him to watch, helplessly, as his plane was destroyed, knowing there was no more Avacyn to intervene. This was her ultimate revenge. She planeswalked away, then, her work finally done (or so she thought). So. That's a lot of history, right? And believe it or not, this was the short version! Each of these Planeswalkers has plenty of reasons to hate the other. Knowing all that, does anyone really think even a war for the fate of the Multiverse could distract them from trying to kill each other? 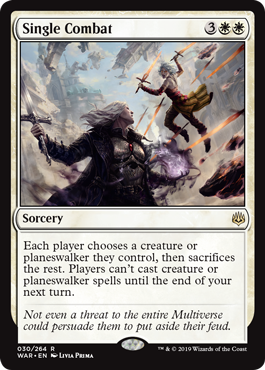 Yep, apparently, while most of the Planeswalkers in the Multiverse are trapped on Ravnica battling desperately against Nicol Bolas (or for him, in a few jerk cases), Sorin and Nahiri are ignoring all that and slapping each other around the battlefield. We've all got priorities. You can see a few more snapshots of their duel on some other cards in War of the Spark. It's pretty clear that they don't care much about the war raging around them except insofar as it affects the terrain—statues, buildings, and even rocks that are actively hurtling through the sky are all acceptable combat arenas. Keep an eye out as you explore the new set!